The Bernese Mountain Dog is a large muscular dog breed, bred to be a working dog! The Bernese Mountain Dog is a working breed dog, known in German as the Berner Sennenhund or Berner. Native to the Swiss mountains, it is one of four Sennenhund types of dog breed. This large breed is popular not only as a farm dog, but as a search and rescue dog, and as a companion dog. The Bernese Mountain Dog makes a great pet and it makes a superb watchdog. It is not excessively aggressive and is loyal to its family. When selecting a Bernese Mountain Dog, look for signs of joint dysplasia and eyelid deformities. Also, keep in mind that adult dogs are often slow to adjust to new owners. Breed Type The Bernese Mountain Dog is a working breed. A popular farm dog, the Berner is originally from Switzerland. Due to its thick coat, this dog is best suited to cool climates. Background Native to the Swiss mountains, the Bernese Mountain Dog goes back to the eighteenth century. Great care was taken to preserve the breed in the late nineteenth century, when foreign breeds began to be imported heavily. The Berner possesses numerous talents and has been used for herding, guarding, search and rescue, and more. Hybrids of the Bernese Mountain Dog include the Bernefie (Berner and Newfoundland mix) and the Saint Berner (Saint Bernard and Berner mix). Description The Bernese Mountain Dog is black with white markings on the chest, head, and toes, and rust markings on the cheeks, legs, sides of chest, underneath the tail, and over the eyes. The ears are mid-length and triangular, and the eyes medium-sized and dark. The nose is black, and the tail bushy. Males are 24-28 inches tall and weigh 85-110 pounds. Females are 23-27 inches tall and weigh 80-105 pounds. Care and Feeding The Bernese Mountain Dog's diet should include poultry, lamb, and wheat. The Berner's coat should be brushed at least once a week, and more often when shedding. Baths should be given only as needed. The Bernese Mountain Dog's dewclaws should be removed while the dog is young. Bernese Mountain Dogs shed seasonally and heavily. Regular vacuuming during shedding periods is a must if kept indoors. Housing Your Dog Berners should have plenty of space, but can be kept indoors. They need a large, fenced yard to run in. Social Behaviors Bernese Mountain Dogs do very well with children due to their gentle yet playful nature. They tend to tolerate strangers well once they realize that their owners welcome them. They usually do well with other pets, including dogs. Handling and Training The Bernese Mountain Dog responds well to gentle training. This is an intelligent, confident breed with a sunny disposition, making training a joy in most cases. Activities Berners need a daily walk in order to stay in shape. They love to play off-leash, and should have regular opportunities to do so. 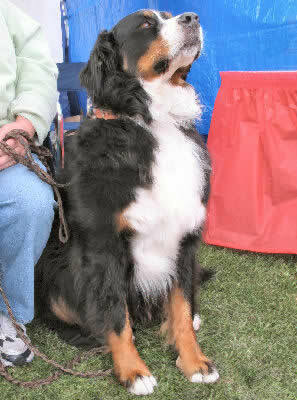 Breeding/Reproduction When selecting a mate for your Berner, check bloodlines for cancer and joint problems. Cancer is prevalent in this breed, but it has few other health problems. Common Health Problems Bernese Mountain Dogs have a short life expectancy due to the breed's predisposition to cancer. Regular checkups are critical for early detection. Availability The Bernese Mountain Dog is easier to find in cooler climates. Prices are usually around $1,000.